Hugh Farmer: Robert Gordon Shewan was born in London on 13th November 1859 (1860 according to 20th Century Impressions – see below) but achieved prominence in Hong Kong as a Scottish businessman. He was the son of Andrew Shewan, master mariner, and Jane Thomson. 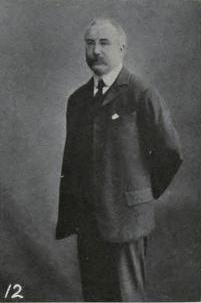 He arrived in Hong Kong in 1881, at the age of 2,1 in connection with the American trading house Messrs. Russell & Co., then one of the largest mercantile firms in the East and subsequently took over the business of this company with another Englishman Charles Alexander Tomes and changed its name to Shewan, Tomes & Co. in 1895. With this firm he formed the Green Island Cement Company and the China Light and Power Company. He was later ousted by the principal shareholder of the electricity company, the Kadoorie Family. He was also a director of HSBC and many other local companies. In 1902 Shewan was elected as the representative of the Hong Kong General Chamber of Commerce in the Legislative Council. In April 1906 he resigned in order to travel abroad. Shewan took a hard line during the Canton-Hong Kong strike in 1925 as he told the Daily Press the employers should punish their Chinese labours who went on strike. He also said he had posted a notice to his office boys and clerks who went out stating that if they did not return by the next morning they never need to come back at all. He died on 14 February 1934 and was buried at the Hong Kong Cemetery in Happy Valley.